“People’s Court” and its countless imitators stem from an idea a man brought to two game show producers in 1975. His idea bore little resemblance to the format eventually used. It was one John Masterson who came to “Let’s Make a Deal” host Monty Hall and his partner, producer-writer Stefan Hatos. His notion was to put cameras in various courtrooms in Los Angeles and air segments of proceedings. Hatos and Hall liked the idea, and paid Masterson for a one-year option. A young associate, Stu Billett, was charged with finding a network to air such a show. Apparently not appreciated by the production company was that in 1975 (and until July, 1984), California Rules of Court, rule 980 barred cameras in the courtrooms. In any event, the option ran out, and Masterson himself tried, unsuccessfully, to market the idea. Billett, who had gone off on his own, remained intrigued by Masterson’s concept. But he thought it needed fine tuning. To get an idea of what court proceedings were like, he went to the downtown Central Courthouse. But then, he recounted, “I stumbled into this small claims court.” Eureka! He witnessed one in which a “little Jewish man was suing a black kid.” The youth had sold the man three pairs of glasses trimmed with colored bits of reflective tinsel. But when he got home, “all of the sparkles are gone,” Billett said. The plaintiff wanted his money back. It turned out, however, that the man had palsy—his hand shook. “He insisted on putting the three glasses in one bag,” Billett noted, resulting in the bits being shaken off as he walked. Masterson, he reflected, “really brought the idea for Court TV.” The format actually utilized, Billett said, was his own creation. Nonetheless, Masterson was given credit as the originator and vested with an ownership interest in the show. Executive Producer of "People's Court" and originator of the reality courtroom format now in use on all TV court shows. 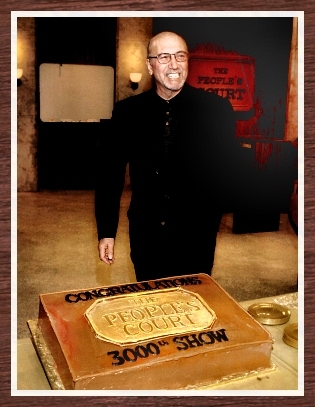 Billett is seen with a cake at the celebration of the show's 3,000th episode, taped in New York on Nov. 16, 2000. "People's Court" is seen locally on KTTV, Channel 11. The jurisdictional maximum in small claims court was then $750. “We didn’t want to become a collection agency,” Billett said, explaining that it was decided that a winning plaintiff would be paid the amount of the award, with a $750 ceiling on it, out of the show’s account. To get on “People’s Court,” the parties dismissed their actions and agreed to binding arbitration, in a simulated courtroom setting. Once again, Billett tried to sell the show to the networks. NBC indicated an interest. But that network’s concept was to have a black comic like Nipsey Russell—who Billett said was “real hot then”—or Pigmeat Markham (whose novelty recording “Here Comes the Judge” led to recurring bits on “Laugh in”) “listen to a case and make jokes.” At a commercial break, he would be “coached by a real judge,” then come back on camera and render his ruling. “It was a stupid idea,” Billett commented. Nonetheless, when Billett mentioned the stupid idea to Tony Cassara, president of the Television Division of Golden West Broadcasters, which then owned KTLA, Channel 5, Cassara was unwilling to dismiss the approach. Billett said that Cassara wanted two pilots to be made at KTLA’s facilities, one done seriously, and the other in a comedic way. One pilot was made—with retired Los Angeles Superior Court Judge Joseph A. Wapner—playing it straight. Billett said he couldn’t go through with making a humorous version. He recalled explaining to Cassara that “they’re real cases” and disputants would not be willing to give up a court adjudication to have some comedian conduct an arbitration. In the end, the networks all rejected “People’s Court,” as did Golden West, and the decision was made to syndicate the show. That held the promise of low ratings and a short run. Just as KABC’s public affairs show “Traffic Court” became a surprise ratings winner in 1957, leading to a wave of courtroom shows, “People’s Court,” starring Wapner, did the same in 1981.